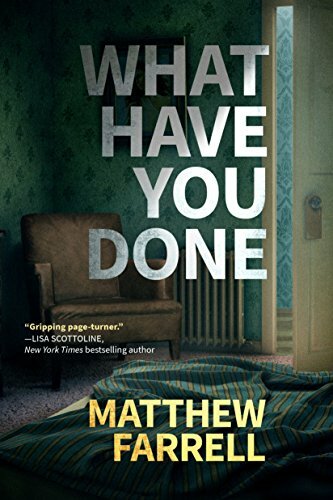 Matthew Farrell’s debut crime novel What Have You Done opens in Philadelphia, rich with the details he absorbed growing up in a police officer’s family. It begins with Liam Dwyer, who is a police forensics specialist, not a police officer or detective—so he shouldn’t get seriously disciplined for being hungover on one challenging morning, right? The problem is, he’s not just hung over—he’s clueless about what he did the night before, how he got home, and where his clothes are, as well as why he has a scrape down his chest. Called out to respond to the mutilated body of a woman found hanging in a seedy motel in the “city of brotherly love,” he’s plunged into a nightmare that may not let him go: not only does the crime scene include an item from his just-before-waking nightmare about a day he nearly drowned, but it turns out the murdered woman is someone from his own past. It’s totally reasonable for Liam’s next move to be phoning his brother Sean, who actually is on the police force, as a homicide detective. And Sean will be on the scene ASAP. It’s not the first time he’s stepped up to rescue Liam, but this time there’s no guarantee, as the evidence mounts up, that Liam can avoid being tagged as the murderer. Farrell skips back and forth between the brothers’ points of view as Liam struggles to combat the evidence, then to run from arrest. Heavy in strings of dialogue, and without a lot of character development, the plot depends on the race against a final box of accusation that could wipe Liam out. There are some twists ahead, all of which are knotted into the relationship Liam has with his wife—and the marriage he’s struggling to save, after his affair with the dead woman had ended. The final untying of the knot is a bit obvious, and won’t challenge “reader detectives” much. But the action pace is sound, and those familiar with the Philly region may appreciate the bar and police scenes as they add up. This is Farrell’s first crime novel, and despite its promising opening, it’s not strong enough to recommend for those already savvy in the genre. On the other hand, if you’re collecting Philadelphia mysteries, add this one to the shelf. And keep an eye out for Farrell’s future work, which may build on his experience in What Have You Done. Beth Kanell is an author of historical fiction and mysteries. Her most recent novel is The Long Shadow (Five Star Publishing, 2018).